With resistance range from 100 W to 20 kW, Models 300144Z and 300145Z combine low typical TCR of Â±0.2 ppm/Â°C from -55 to +125Â°C, tolerance matching to Â±0.005%, and load-life stability ratio of Â±0.005% at +70Â°C for 2,000 hours at rated power. Z-Foil resistors provide almost instantaneous thermal stabilization time of less than 1 sec. Power rating is 0.2 W at 70Â°C, divided proportionally between 2 elements, over max working voltage of 200 V.
MALVERN, Pa. - Feb. 6, 2009 - Vishay Intertechnology, Inc. (NYSE: VSH) today introduced two new ultra-high-precision Z-Foil voltage divider resistors that feature a low typical TCR of ±0.2 ppm/°C from -55 °C to +125°C, +25°C ref., TCR tracking to 0.1 ppm/°C, tolerance matching to ±0.005 % (50 ppm), and a load-life stability ratio of ±0.005 % at +70°C for 2000 hours at rated power. While other resistor technologies can take several seconds or even minutes to achieve a steady-state thermal stabilization, the 300144Z and 300145Z have an almost instantaneous thermal stabilization time of < 1 second. The devices released today offer a power rating of 0.2 W at 70°C, divided proportionally between the two elements, over a maximum working voltage of 200 V. The 300145Z provides a pair of 300144Z elements back to back in a single molded package. 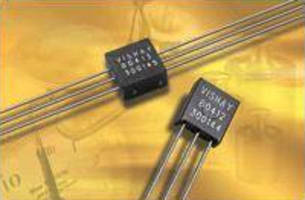 The resistors feature a resistance range from 100 W to 20 kW. The 300144Z and 300145Z are not restricted to standard values, and can be supplied with "as required" values and ratios (e.g., 1 kW vs. 1.2345 kW) at no extra cost or delivery time. The new resistor dividers allow designers to achieve much better performance by combining a range of high-precision specifications in a single device. In addition to their low absolute TCR, tight tolerance, and excellent load-life stability values, the 300144Z and 300145Z offer PCR tracking (".R due to self heating") of ±5 ppm at rated power, a low voltage coefficient of < 0.1 PPM/V, and current noise of < -40 dB. The resistors provide an almost immeasurable 1-ns rise time, effectively without ringing, and a non-inductive (< 0.08 µH), non-capacitive design. The devices are available with standard tin/lead or lead (Pb)-free terminations. Offering the utmost in ESD immunity, the resistors withstand electrostatic discharges up to 25 kV, for increased reliability. In spite of a low TCR tracking, a resistance ratio may change considerably based on the absolute TCR. To assure good ratio stability, designers should utilize resistors with the lowest absolute TCR possible. To achieve optimum TCR tracking between resistors, all factors that affect the TCR of each resistor must be uniform. Whatever their resistance range or wattage, the 300144Z and 300145Z resistors exhibit identical TCR, as they are made of the same alloy and of identical physical and electrical characteristics. This TCR uniformity in Vishay Foil resistors contrasts sharply with TCR tracking in conventional metal film, such as thick and thin film units, which offer quite variable and often unpredictable absolute TCR because their composition, film thickness, and deposition techniques are varied to meet different resistance range and wattage requirements. The foil element of the 300144Z and 300145Z consists of a special alloy chosen for its electrical, mechanical, and thermal characteristics. It is set on the substrate through a unique and proprietary process that does not subject the 300144Z and 300145Z to the metallurgical changes that occur during the winding of wire, or during the evaporative process used in other forms of precision resistors. Each step of the manufacturing process is rigidly controlled, with extensive quality control ensuring that the alloy is kept in its pure state. Typical applications for the 300144Z and 300145Z will include precision instrumentation amplifiers, bridge networks, and differential amplifiers in high-end medical, military, aerospace, automatic test, and down-hole drilling equipment where thermal stabilization, response time, and long-term stability are vital. Samples and production quantities of the 300144Z and 300145Z are available now, with lead times of 72 hours for samples, and five weeks for standard orders. Vishay Intertechnology, Inc., a Fortune 1,000 Company listed on the NYSE (VSH), is one of the world's largest manufacturers of discrete semiconductors (diodes, rectifiers, transistors, and optoelectronics and selected ICs) and passive electronic components (resistors, capacitors, inductors, sensors, and transducers). These components are used in virtually all types of electronic devices and equipment, in the industrial, computing, automotive, consumer, telecommunications, military, aerospace, and medical markets. Its product innovations, successful acquisition strategy, and ability to provide "one-stop shop" service have made Vishay a global industry leader. Vishay can be found on the Internet at www.vishay.com.